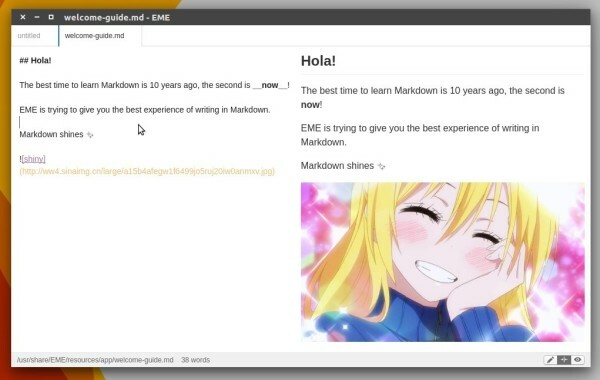 EME is an open-source markdown editor developed with Node.js and Electron framework. Works on Linux, OS X, and Windows. The editor provides a simple user interface with editor only, preview only, or both editor and preview mode as you wish. A Focus Mode allows to focus right on the paragraph you are writing. Vim Mode offers the powerful vim key bindings support for the editor. Developer Tools, and Chrome based. As a one month old project, request new features and report bugs at its project page. Grab the latest .deb package and then click install it via Ubuntu Software. Finally launch the markdown editor from Unity Dash / App Launcher and enjoy!